For those wondering how Bill Clinton could pardon white-collar fugitive Marc Rich but not Native American leader Leonard Peltier, important clues can be found in this classic study of the FBI's COINTELPRO (Counterintelligence Program). 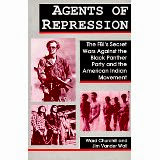 Agents of Repression includes an incisive historical account of the FBI siege of Wounded Knee, and reveals the viciousness of COINTELPRO campaigns targeting the Black Liberation movement. The authors' new introduction examines the legacies of the Panthers and AIM, and shows how the FBI still presents a threat to those committed to fundamental social change.